Undergoing a teeth whitening treatment is one of the safest and easiest ways to improve your smile. 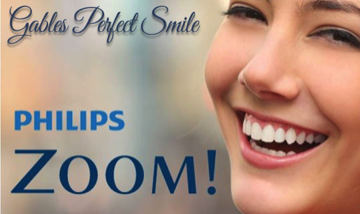 If brighter teeth are all you need, teeth whitening is a treatment which is more conservative, less invasive and less costly than porcelain veneers or resin restoration to make your teeth look better and rejuvenate your smile. There are usually two options when we talk about professional teeth whitening. The first one is an In-office whitening where the patient sits at the dental chair for about 2 hours and gets immediate results. The second option is a take-home whitening kit where the patient has to come to the office to get some custom trays made for his mouth and once home, the patient loads the trays with the whitening solution and wears them for a period of time for one to two weeks. The results are very similar using both methods but most patients prefer to get immediate results. When you schedule a consultation at our Coral Gables practice, near Miami Beach, we will assess your smile to determine which type of whitening would be more adequate for your specific case and oral conditions. Since our passion is focusing in Anti-aging Dentistry, we are committed to proving the best cosmetic dental treatments in Miami.